When stone fruits are in season, I can’t help buying them in bulk. The problem is that they don’t last very long. 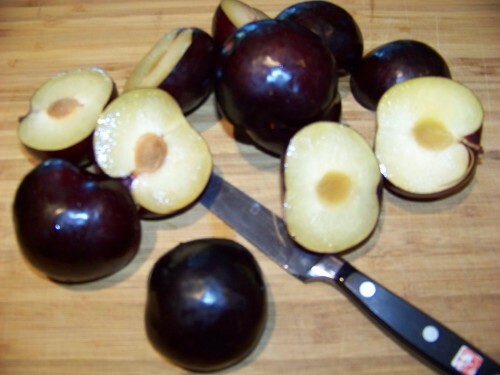 Even at the rapid rate I gobble them, I can never finish all of the purchased peaches or plums. The solution? Bake with them, of course. This “buckle” cake is delicious either as a dessert with ice cream or whipped cream, or with coffee for breakfast. Preheat oven to 350°F. Grease a round, 10-inch-diameter cake pan with cooking spray. A springform pan would work, too. Line the bottom of the pan with parchment paper. Grind the almonds in a food processor. Mix the ground almonds in a medium bowl with flour, baking powder, and salt. With an electric mixer, beat the butter in a large bowl. Add 1 cup white sugar and the brown sugar to the butter mixture; beat until well blended. Add the eggs 1 at a time to the butter mixture, beating well after each, and then add rum, vanilla, almond extract, ginger, and cinnamon. Add the flour mixture and stir until incorporated. Transfer the batter to the pan and spread it evenly. 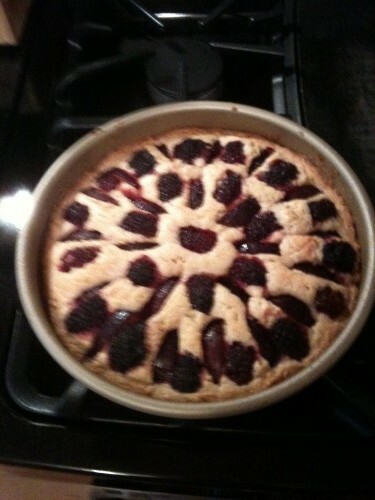 Press the plum slices, flesh side down, and the blackberries into the batter (pretty patterns are encouraged). The cake rises quite a bit, so do not overfill the pan. Sprinkle the 2 reserved tablespoons of sugar over the top of the cake. Bake until a toothpick inserted into center comes out clean, about 50 minutes. 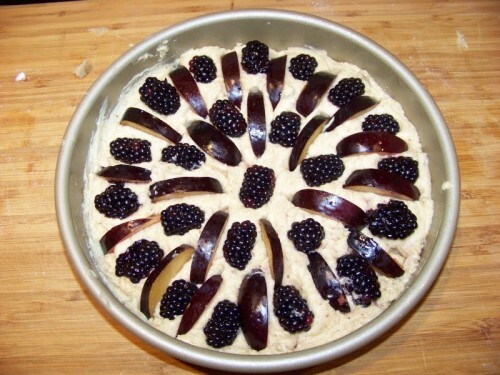 The fruit will sink into the cake and the dough will “buckle” around it (hence the name). Let cool and serve in wedges. This is a great fall treat. So pretty! Love your buckle, babe! & looks like you had an amazing day! I’ve ate blueberry buckle before. 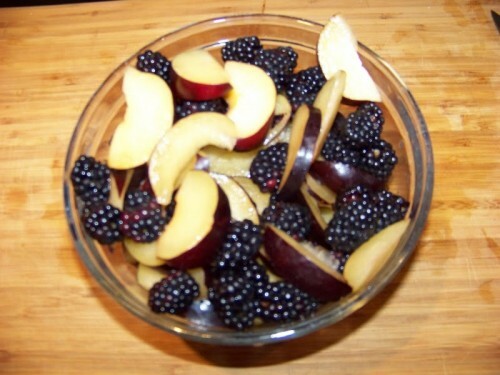 Blackberry buckle sonds good too. Thanks for the recipe. this looks so delicious! i’ve been in the baking mood too, maybe it’s this fall-ish weather. This sounds great and I’m definitely in the same boat! We get tons of fresh fruit in our CSA every week and I find it hard to use them all up, but baking with them definitely does the trick! This sounds awesome! I just wish Kyle ate fruit. 🙁 Sharenberg treat perhaps? I can attest – it was delicious.